IRON COUNTY — Two women were injured and rushed to Valley View Medical Center in Cedar City Tuesday afternoon following a two-car accident that sent one of the vehicles rolling. The incident began when three vehicles traveling east on state Route 56 encountered two farming swathers in the opposite lane of travel. The first vehicle in line slowed down and moved to the right to allow room for the oncoming machinery to pass, Utah Highway Patrol Trooper Scott Mackelprang said. Swathers are large pieces of farming equipment with blades on the front that are used for cutting hay. As the first vehicle slowed and moved over, a woman driving a white Subaru Outback behind it began to follow suit. Her vehicle was struck from behind by the third car, a gold Ford Explorer. 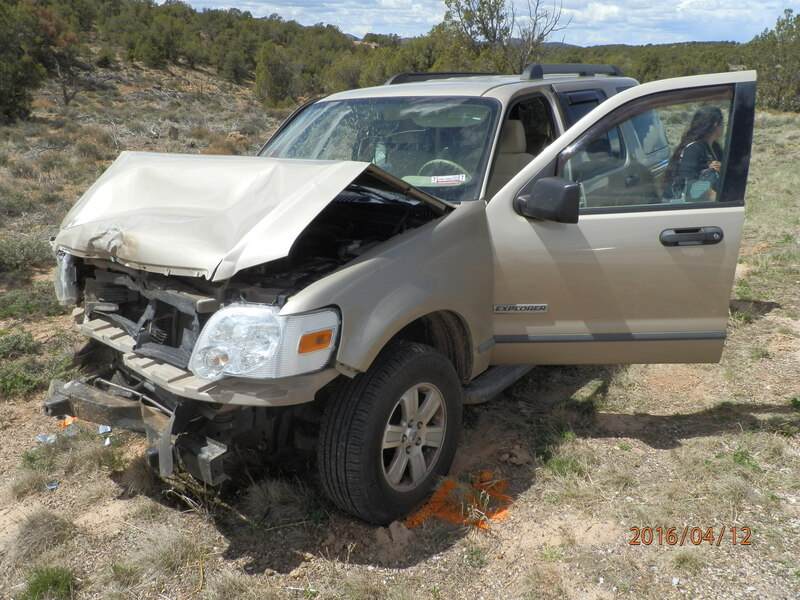 There were two women in the Explorer, the trooper said, on their way from Enterprise to Cedar City. The momentum from the collision sent the Outback careening into the embankment on the right before the driver over-corrected to the left and rolled into the road. “(The Outback) came to rest on its top, right in the center of the road,” Mackelprang said, adding that it was unclear whether the driver had been wearing her seat belt. The Explorer came to a rest on the shoulder of the eastbound lane. “It’s a good smash on that (Explorer’s) front end,” he said. The incident was reported at 12:45 p.m. Both the driver of the Outback and the passenger of the Explorer were transported to the hospital by Gold Cross Ambulance. Since the Outback came to rest in the middle of the highway, Mackelprang said, traffic had to be diverted around the incident for about an hour. Traffic was diverted using the westbound shoulder of the road, with troopers allowing one lane of traffic through at a time until the roadway was cleared. The man in the front car saw the tail end of what happened and stopped to give a report, according to Mackelprang. In addition to UHP and Gold Cross Ambulance, the Iron County Sheriff’s Office responded to the crash. No citations were issued. The incident is under investigation.